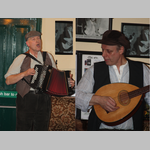 Graeme Meek and Barry Goodman are Life and Times and are a multitalented duo, both of them being instrumentalists, singers and songwriters. You may recall them bringing their show, “Where The Working Boats Went”, to the club a few years ago. They have a vast repertoire to choose from so I know we are in for a treat. Get your chorus voice ready.